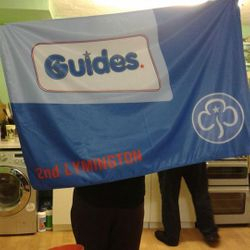 From the earliest days of Guiding, respect for the national flag and what it stood for was considered a key part of Guiding, and Guides were encouraged to be patriotic. Making a Union Flag was one of the early challenges. 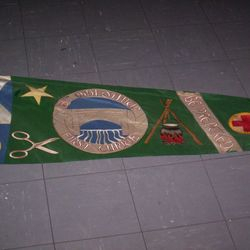 Many units saved hard to raise the money to buy a national flag of their own mounted on a pole to carry in parades, and would also seek to obtain one which was 'roped and toggled' so it could be hoisted in camp - and once that was achieved, many sought to get a unit 'carrying' flag of their own. In those days, the recognised National flag for Guiding purposes was the Union Flag, not the flag of the individual UK nation. Unit Flags could be supplied either plain, or 'lettered' - with the unit's official name printed on the flag at so much per letter (it paid to have a short name!) Then as now, flag holsters were also available, to assist with carrying the weight of the flag, especially in inclement weather. Once the Unit or Union flag was obtained, great pains were taken to brush up the unit's Company Drill to ensure the flag was treated with all due respect - army drill manuals were consulted, and soon Guiding drill manuals were being published to cope with the demand for clear instructions on the ceremonial, for both general drill and for flags. At camp the flag would be raised with due ceremony upon arrival, and would then be 'guarded' throughout the camp, with Guides taking turns to collect rations and station themselves around the perimeter of the campsite on 'sentry-go' - both day and night. Later, sentries were done away with, and the flag was raised each morning, and lowered at sundown and put in a place of safety such as the mess tent - this was also done if the entire unit were going on an outing. The evening flag-lowering ceremony would usually be when 'Taps' was either sounded on a bugle, or sung, and if the unit held a "Guides' Own" act of worship this might be held around the flagpole too. Union Flags always had a 'spike' as a flag finial (although in some areas people opted to unofficially fit trefoils to them). 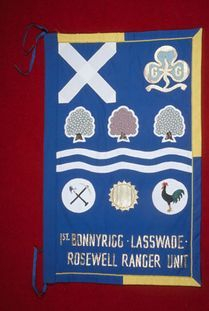 Unit flags were traditionally fitted with a trefoil finial - plain brass for Guide units, with enamelled finials being introduced for Land, Sea and Air Ranger units, and also for Extension units. The style and design of the finials varied over the years so can give a clue to dating (however, given how durable and ripe for re-using the solid brass trefoils were, and the cost of them, it cannot be relied on as a single source of dating a flag!). Some 'carrying' flags had a set of tasselled cords hung from just below the finial - usually in blue and yellow on World Flags, and in red, white and blue on Union Flags - but not all. 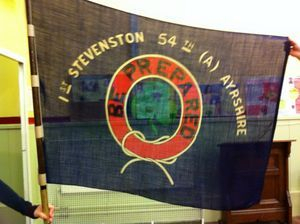 The first recognised design for unit flags was established by the early 1920s, and took the form of a rectangular navy flag, with the 'first class badge' in the middle, and the unit's official registered name in printed lettering arranged around the logo, as seen in this example from Stevenston. It was mounted on a wooden pole with brass fittings, the finial having a brass trefoil. The trefoil for Guides was not enamelled, the trefoil for (Land) Rangers had red enamel infill, and that for Sea Guides/Sea Rangers had navy blue enamel infill. 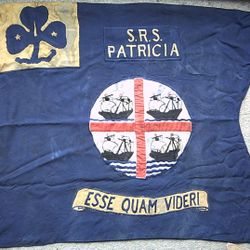 Equally, the First Class badge in the centre was in the appropriate colour for the section, the Guide unit flags having a green trefoil, the Land Rangers a red trefoil, and the Sea Rangers a blue trefoil. 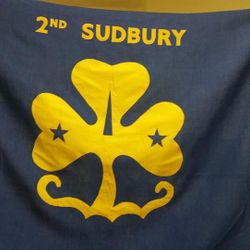 Although many flags from this era have long been retired, and many have succumbed to the ravages of moths, this example is still in current use and I'm grateful to the unit for permission to use their photograph of it. From the mid-1930s onwards, a new design was produced for Guide flags - gone was the First Class badge, as now in the UK the new World Badge was the basis for the design. Instead of being on navy fabric the new flags were on mid-blue, with yellow trefoil appliqued on in yellow, and yellow lettering in the centre along the top edge, with the flag design being the same for all Guide and Ranger units. The base of the trefoil was almost banana-shaped. There was also a new design of flag trefoil, which has a scroll at the bottom where the previous design had none. 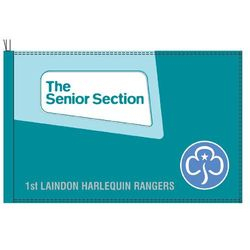 The trefoils still had coloured enamel for the Rangers sections, in Red for Land Rangers, Navy Blue for Sea Rangers, and Light Blue for Air Rangers. There was the option of having lettering added - this was sewn on, with a charge per letter. From c1939, the design of flag for Sea Rangers changed - instead of having a standard World Flag as for the other sections, they had the option of having a 'burgee' - a rectangular flag with a swallow-tail, with each quarter being designed to show the symbolism of the Crew. Designs had to be approved by the relevant flag authorities in England/Scotland, and had to be consistent with the rules of heraldry in the particular country. The style of the apliqued Trefoil in the centre of the flag varied, with the shape at the bottom of the trefoil changing to a heraldic feu sometime in the late 19302-mid 1940s, but the basic design of Guide flags remained unchanged until the mid 1990s. From 1968 onwards, the separate enamelled flag trefoils were dropped, and the options were plain brass for Guide units, and aqua enamel for Ranger units. Until recently . . . In the mid-1990s the design of the World Flag changed, and in due course so too did the design of unit flags. Instead of having lettering on the top edge, it now appeared bottom left. And rather than being appliqued on both sides of the flag, the design was printed, on one side of the flag only. With the new design of World Flags for unit flags, there was also a change in the Trefoil design, which was now enamelled to match the Promise badge - and was available with a choice of the trefoil being one-sided, or enamelled on both sides, as shown. 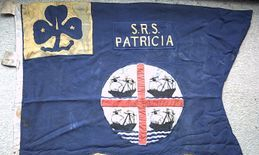 As well as the official designs for Unit Flags, other designs can be seen in some areas, sometimes designed to resemble the official designs, sometimes home-made designs such as the one shown which dates from c1932, but is not of the standard design - not on a blue ground, but on green silk, with a mixture of applique and embroidered decoration . . . 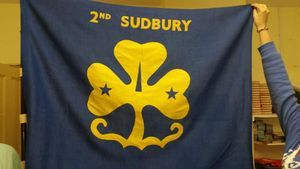 This flag was in use for many years right up until the late 1980s for outdoor parades, and thereafter used indoors up to 2010, when it was fully retired. It has since been conserved and is now on display. Particularly post-1968, Ranger units have been encouraged to design and make their own unit flags, showing symbolism from their unit and the geographical area it covers (which in itself is a useful means to encouraging an interest in local history). Although the designs have to be passed by the relevant heraldry authorities in either England or Scotland, and there are strict rules regarding the symbolism, the colour combinations, and the designs which can be incorporated, this has given a lot of scope for original design. 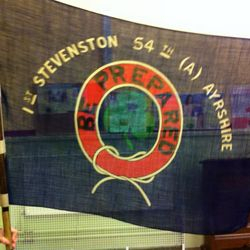 The skills in turning the design into a flag, too, serve to develop a range of skills to turn the initial design into reality, such as in this example from Midlothian County in Scotland. 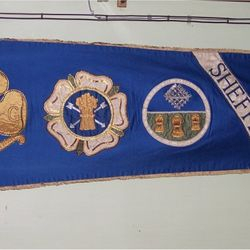 But it wasn't just Unit Flags - soon, with the encouragement of leading figures within Guiding such as Rachel Kay-Shuttleworth, Counties were arranging to get banners designed and made - and banners were also made for important figures such as the Chief Guide and the national Chief Commissioners in the UK. These were usually made in banner form, designed to be carried at formal occasions, and featured complex hand-embroidered or appliqued designs full of symbolism. Although normally a Trefoil finial was used, on some banners other finials can be seen, such as that for County of the City of Edinburgh Guides, which has a carved wooden figure of St Andrew, the Patron Saint of Scotland. 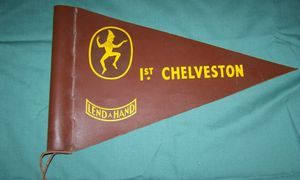 Prior to 1983, Brownie units were not permitted to have or carry flags, but instead carried 'Pennants' - a triangle of brown leather mounted on a short pole around a foot long. 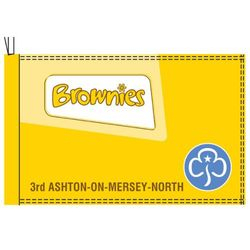 The Brownie badge and the unit's name printed in golden yellow on each side. These had been introduced in the 1950s to meet demand. In the early years, where Guide Patrol Leaders carried Patrol Flags, Brownie Sixers carried 'wands' - a short fine rod, with a cut-out of the Six emblem mounted on top. 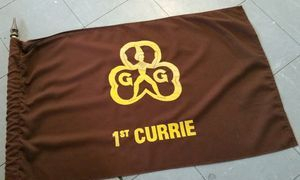 It was in 1983 that the first Brownie Flags were introduced. 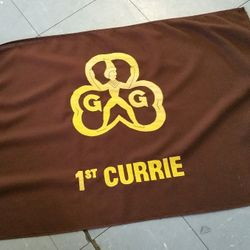 They were made of thin woven brown cloth, with the Brownie badge appliqued in yellow, and the unit's name appliqued in yellow lettering underneath. 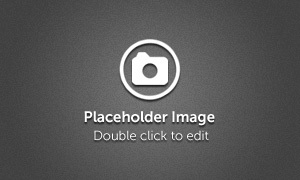 The three-section elastic-jointed pole was of hollow bronzed lightweight metal rather than solid wood, and it had a turned wooden finial in dark varnished wood. A special leather carrying holster was also available, to assist with it's use in parades. 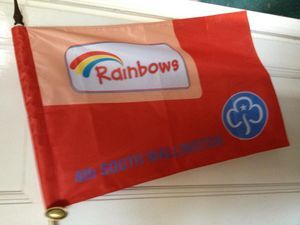 New flag designs were introduced in 2014, to match the new branding - and alongside the yellow Brownie flag, the blue Guide flag and the aqua Ranger flag - for the first time Rainbows were allowed to have and carry a unit flag. 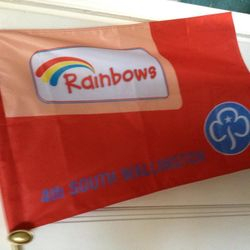 There was a choice of whether to have a traditional single-pole flag as shown in this picture, or a banner with poles at either end, the poles for Rainbow flags being the same lightweight metal as for Brownie flags. At the same time, the flags for the other sections were changed to a similar design - examples of the flags for the other sections can be seen in the slideshow below. 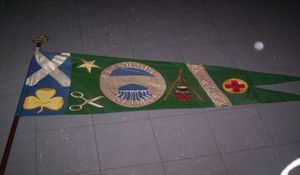 There is still scope for hand-made unit flags to be created, and many units still seek to do so. Whenever a unit is considering creating a new unit flag, they should start by seeking advice from the College of Heralds (for those in England, Wales and Northern Ireland) or the Court of the Lord Lyon (for those in Scotland) - both bodies can supply initial advice and information on designs, and on the relevant heraldry rules which need to be followed. Once a design has been drawn up, it should be submitted first to the Heraldry Adviser at CHQ, who will be able to assist with the finalising of the design, and give helpful suggestions on materials to use, permissions required, and other requirements.